At this time last week I was having very intense, long, focused and productive sessions with the rewrite of my story Blow Me a Candy Kiss. 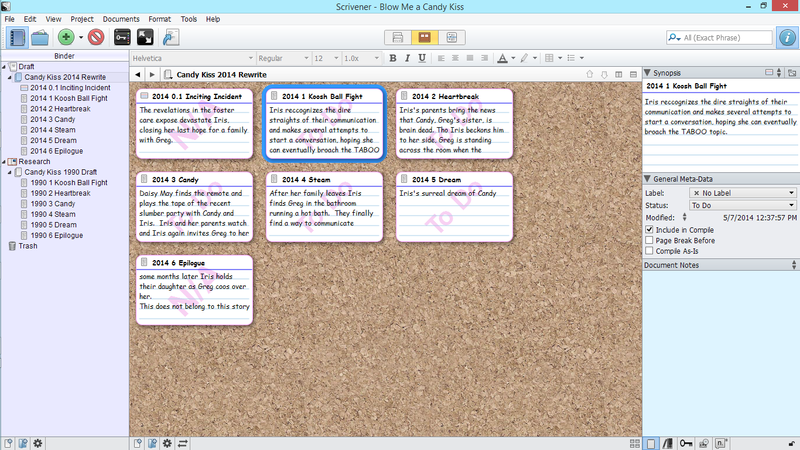 Then I got the idea that I needed to go ahead and get Scrivener so I could use it's storyboard and split screen abilities. 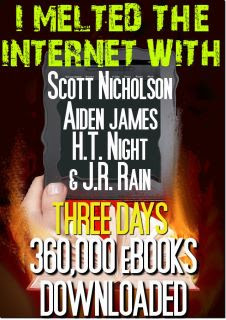 I'd used a free trial for NaNoWriMo in 2011 and by winning was eligible for a 50% discount in December of that year but dithered too long. 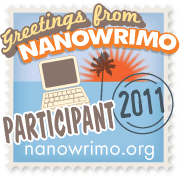 By winning Camp NaNo in April I was again eligible and leaning hard towards getting it. So last Friday I did. After three days working the interactive tutorial and three days getting the working rewrite draft set up I'm am finally ready to get back down to business. This is what my desktop looked like when I was working on the story last week. On the left is the main window of WhizFolders my preferred note taking, resource organizing and rough draft application for over a decade now. In fact if you include the years I used its precursor, WhizNote, it's nearly two decades. I'll continue to use Whiz as before for most info organizing and rough drafting tasks. I can't imagine my days without it. 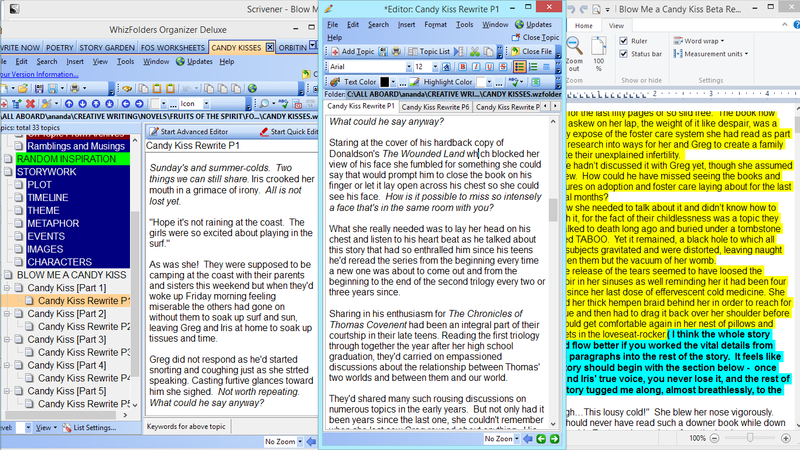 In the middle is the Whiz tabbed Editor window. When working a draft hard I set it up like this so I can have one topic window open in the main window for reference as I type in the other. It might be an earlier draft of the scene I'm working on or another location in the same draft or notes relevant to the paragraphs I'm working. 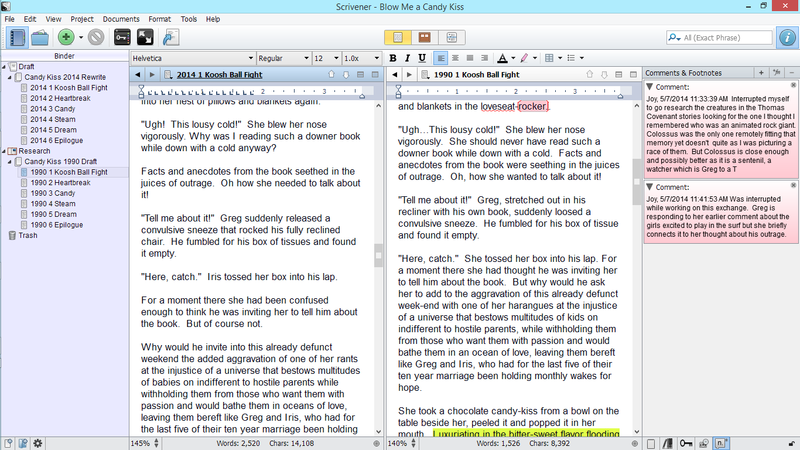 Scrivener's split screen function does this well in a single window. But that isn't enough of an improvement to warrant switching out of Whiz for revising the rough draft. The rightmost window is the Word Pad draft of the story I sent to my one Beta Reader who sent it back with her commentary embedded in the draft with distinctive fonts or highlights. I was going to import it into the Research section of the Scrivener draft to make it available for the split screen but I'd already put the original copy of that draft there so instead I'm copy/pasting her comments into the comments function attached to the same line in the story in that 1990 draft. They will then be available via sidebar or a hover text in the draft. That comment function is handy also for tagging something needing fixed that I come across while scrolling past on another task. It would also work for transferring the notes I scrawled on the hardcopy as I read Les Edgerton's Hooked. Today while setting up the rewrite draft I found several places where I'd left a sentence or a dialog exchange unfinished due to an interruption while working last week. Luckily I still remember what my intentions were and was able to tag them and indicate those intentions in a comment. I had good ways of doing the same thing in Whiz so, tho it is slick looking and invisible until I need it, that wouldn't have been enough to pull me away from Whiz for drafting beyond the rough first draft. Basically it's the storyboard that was the draw. I need that function for taking my unstructured rough drafts (all those WriMo messes) and creating the architecture of a story that works. The hierarchical outline Whiz uses is great for a lot of things in the way I work but I couldn't make it work as a substitute for a storyboard. Ironically it was the storyboard like way that WhizNote functioned with its endless desktop on which I could open the individual topics and move them around at will that got me hooked on Whiz. After I got WhizFolder I kept WhizNote in use for that storyboard feature as long as it was supported. That support ended with Windows XP so after I got my Windows 7 netbook in January 2010 I scrambled for substitutes and found possibilities in Xmind, Freemind, and the Celtix script writing software but they each seemed more of a distraction than a help. It's possible I just didn't give any of them enough time for familiarity of their function to tip my focus off the tool and onto the story. As for Scrivener I'm excited about the prospect of working a clean draft in an uncluttered environment. In the spirit of that need for no clutter I think, since most of my novels in progress are really collections of short stories, I will create a Scrivener file for each story for storyboarding and drafting through to the final draft. For drafting I want to keep the distractions as few as possible. Thus for the novels if I open one at all it would only be for storyboarding the collection of stories into a coherent arc. I can think of two exceptions. Both are multi-POV (20+) using short vignette or flash fiction pieces that wouldn't hold their own outside the structure of the novel. Of Magic, Memories and Coping Mechanisms. I'm HAPPY and I know it Clap your hands!